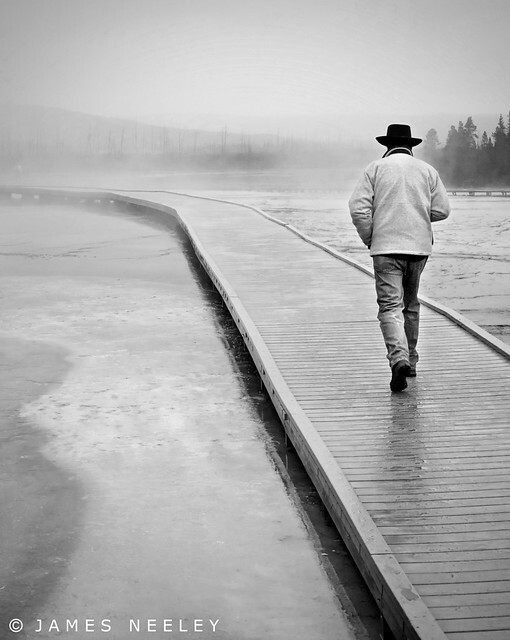 Bill Wight walks ahead on the boardwalk at the Grand Prismatic Spring in Yellowstone National Park. The black and white conversion was done using the Black & White tool in Photoshop. The upper right portion of the image uses the High Contrast Blue filter while the lower left portion of the image uses the High Contrast Red filter. The two images were layered and merged. The reason for the two filters is that Bill was wearing blue jeans which became totally black with the red filter and I wanted to show some detail here. On the other hand, the red in the spring runoff became an ugly black with the blue filter but show nice light details with the red filter. I love the flexibility of digital black and white conversion verses using fixed filters which apply the effect globally. Check out the video below for details on the conversion.